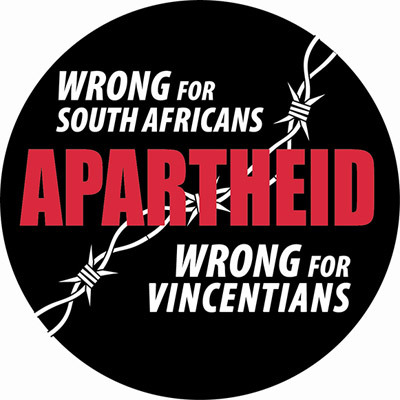 Apartheid is a plague in SVG and it must be abolished now. All over SVG we can see the damaging consequences of apartheid. There is a high teenage pregnancy rate, poor children are going hungry, families struggling to survive, many households cannot afford water and electricity, there is a high crime rate, many young people end up in jail and the children of the poor are getting left behind in education, as shown again in the new Common Entrance Exam results of 2011 and 2012. The apartheid protects the interests of Taiwan and the white super-rich of Mustique and Canouan by given them blanket tax and customs duty exemptions. Meanwhile, poor Vincentians face high water and electricity prices and suffer under VAT. The rich can sip champagne and laze by the pool all day, yet the poor suffer. Canouan, Mustique and Taiwan must pay the SVG Treasury all the tax and customs charges they have avoided. These differential laws and policies that discriminate in favour of the super-rich whites (fewer than 2% of SVG's population is white), over and above the interests of African origin, Indian, Carib and mixed race citizens are vile, disgusting and inhuman. They are there for one purpose only: to keep the rich, rich and to keep the poor, poor! A Green government will abolish apartheid in SVG. We will abolish the Mustique Company Act no 48 of 2002 and the Canouan Act, as these differential laws and policies that perpetuate apartheid. All Vincentians deserve prosperity - white or not!